The Rocky River City School District Transportation Department's mission is to support the education process through safe, friendly and professional transportation services. Bus transportation – the safest form of transportation – is provided for Gr. K-8 students in the Rocky River City Schools, based on each school’s transportation zone. 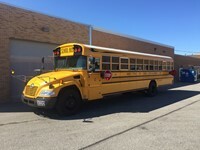 As required by the state of Ohio, every bus driver attends special school bus training before transporting any of our students. The training consists of 32 hours in the classroom and 24 hours behind the wheel. In total, every bus driver – including substitutes – spends at least 3 weeks to one month training to be a school bus driver. The school division’s training actually exceeds the state’s minimum. Parents are encouraged to read the Bus Conduct Policy listed under Forms to the right as it clearly outlines the conduct for all students while riding a school bus. To ensure the safety of our students, parents should consider sharing “watch” responsibilities with a neighbor so your children have an adult overseeing safety at their bus stops. Parents are encouraged to remind their children of acceptable behavior on a school bus. Childcare Provider Forms must be completed in order for transportion to begin at a location other than your residence. New forms must be completed annually. Need transportation to or from a location other than your residence? Please complete the Childcare Provider Form. If your home address is within the "walk area" of your child's school and you would like to request transportation from an existing bus stop located near your home, please complete the Space Available Form. If you have a concern about your child's bus stop and would like to request a change in location or time, please complete the Bus Stop Change Request Form. Frequently asked Transportation Questions for Kindergarten Parents. News clips on high tech equipment on our buses.